The lights are dimming. The curtain begins to close. 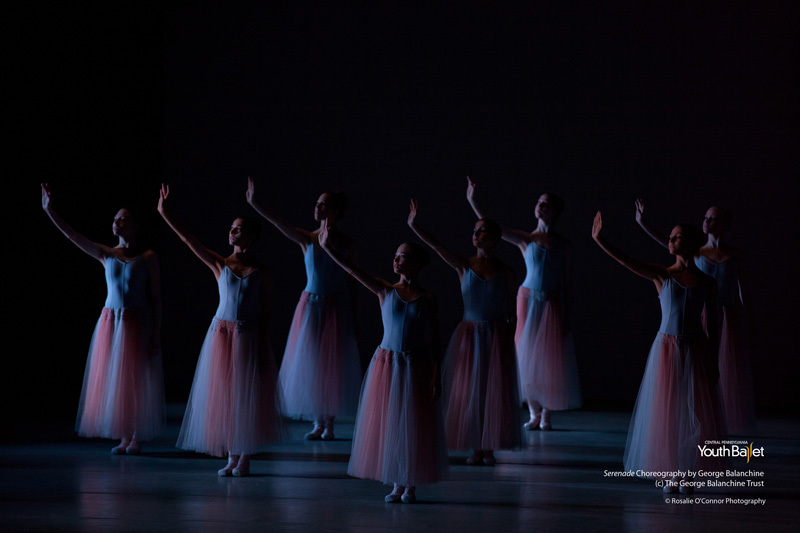 As we prepare to say good-bye to another wildly successful academic year, Central Pennsylvania Youth Ballet’s 2014 June Series is waiting in the wings. Pennsylvania Ballet dancer and CPYB alumna Leah Hirsch so eloquently expresses the importance of this yearly production. I hope you enjoy Leah’s thoughts as she prepared to take the stage for the last time as a CPYB student. Sixteen women fill the stage, united in movement, a graceful sea of blue before my twelve-year-old eyes. They are strong and still, reminiscent of Greek goddesses. This is the opening scene of George Balanchine’s Serenade, and I am entranced. I gasp, overwhelmed by the beauty of the setting. Suddenly, Leta Biasucci* takes the stage, gliding from the wing as the Waltz Girl. Her movements are effortless as she skims through the other dancers, a crest atop their waves. The corps echoes her movement. Motion is contagious. This was the moment my life changed direction, that my dream was born. Seeing Leta dance the iconic role of the Waltz Girl in a Central Pennsylvania Youth Ballet production made me realize that I had to work with Marcia Dale Weary. My family and I moved from the metro New York area to Carlisle, Pennsylvania, so that I could train at CPYB. Marcia has guided and instructed me, as she has done with countless other students. To her, neither bowed legs, nor turned-in knees, nor flat feet, could stand in the way of a child’s dream. This is her philosophy. Each class is another opportunity, another step towards the ultimate goal. Now, as we prepare to embark on the next leg of our personal journey, we must look back and appreciate what we have gained from our time at CPYB. Truly, Marcia’s 55 years of experience are so much more than can easily be quantified. To merely reference that milestone is an understatement in so many ways. For a teacher to have worked with thousands of students is more than a passion, it is a destiny. To be able to train, refine and perfect as Marcia has is a gift. I see Marcia now, as CPYB celebrates its 55th year, never weary, never doubtful, always with the same glimmer of hope in her eye. She has taught me, as clichéd as it may sound, that anything is possible. Talent is a minute portion of success; determination and perseverance are the true deciding factors. Marcia’s guidance and constant dynamism have shaped us all and given us the strength to conquer whatever challenges are put in our paths. It is especially appropriate that you are joining us for the June Series. These performances represent the culmination of a year’s dedication and work of the students and staff of CPYB. A metaphorical representation of the season, the June Series shows the blossoming of all levels of students as they execute the works of great geniuses and emerging choreographers. At the same time, the June Series serves as a snapshot of each stage in the evolution of a dancer. The young ones in black ballet shoes, the older ones en pointe, and dancers about to head off to professional companies, college or work: all are present on this stage. The young girls and boys look up with great regard to the students in the professional division of the school. We become their role models. In these older dancers you will see not only the manifestation of their own dreams, but also the nascent dreams of the young girls and boys sitting in the audience. The stage is representative of two ideals. In a physical sense, it is the breeding ground for our improvement year after year. Figuratively, it represents the next stage in our life. It is the last chance of the season to see the future stars of tomorrow. As the curtain opens for June Series 2011, that twelve-year-old girl in awe of Leta will take the stage for the last time as a CPYB student. I will be dancing the role of Waltz Girl in Serenade not only for myself and my family, not only for the audience, not only for you, Marcia, but also for that little girl with the black ballet slippers in the wing. In the audience, in the wing, on stage: June Series is a launching pad for dreams. “The Birth of a Dream” was first published June 2011. Pennsylvania Ballet dancer and CPYB alumna Leah Hirsch was named one of Central Pennsylvania’s 2011 “Best and Brightest” by The Patriot-News. She also attends the University of Pennsylvania part-time. *Leta Biasucci is a CPYB alumna and a Pacific Northwest Ballet soloist.